My mother loved puzzles of every kind. As children we were encouraged to investigate clues and understand paradoxes, and the house was covered in puzzle books. 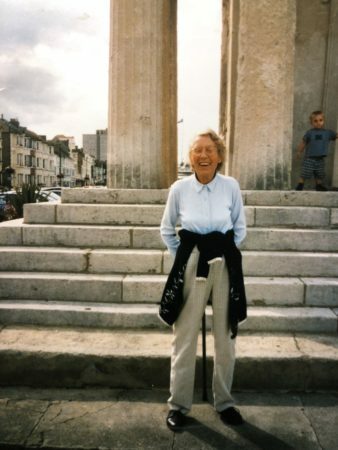 She could crack most cryptic crossword puzzles in minutes and often wrote shopping notes in code, a mixture of Pitman shorthand and her own weird abbreviations. This love of unravelling mysteries extended to logic games. Out of the blue I remembered one of hers this morning. Whether or not the solution is fair I leave that to you to decide. All I can say is that it reveals a lot about her mindset. Just then, the lady with the hat dropped her hymn book and bent to retrieve it. As she reached forward, the peacock feather drooped and touched the back of the old man’s neck. The old man fell down dead. Why is this story untrue? Colour is a matter of personal perception, so what I’m about to write might be on completely the wrong track. I think the untruth arises in the description of the feather in the lady’s hat as a long, blue peacock feather. The blue feathers are on the peacock’s body and neck and they look quite short to me. As such they are unlikely to brush the neck of the unfortunate old man. The long plumage of the tail is multi-coloured: only the eye is blue. Though this is probably a matter of arbitrary definition, are the tail feathers technically feathers? I’m pleased to be corrected on all of this by an expert on birdology. If the man is dead (guess of a heart attack), then nobody could know what he was dreaming about before he pegged it. So I suppose it’s not necessariy “untrue” , but more “unproven”. Martin, the man could be a somniloquist. After reciting Newton’s Laws in Latin, he gave a detailed commentary of his dream, all dutifully recorded by his neighbours? The big point remains: if it wasn’t observed (or even observable), how can it be ‘true’ (hi)story. And with one small step we move the blog to somniloquism and untranslated Latin. Of course, Mr Tolley is correct and thus demonstrates two principles. 1. Those of us who fell asleep in Latin were wise to do so. 2. Don’t overthink simple puzzles. Ah, I was going to suggest the answer – peacocks don’t have feathers, peahens do but I’m getting my brainteasers mixed up. Hang on! Where’s the 4th Umpire! That story is told by a third person omniscient narrator? Ergo: His thoughts/dreams can be known by the reader. Mr. Fowler, speaking of untrue, check Janice’s observation on Watergate in Lonely Hour; no articles of impeachment were presented, voted upon and certainly not passed. I may have misheard the audiobook; but you may want to edit for US version for clarity. Too late, I just finished listening to Lonely Hour on Audible in Southern California. Like Brooke, I may have lost concentration treading my way thru L.A. traffic, but I think there is a very noticeable loose-end. Nevertheless I thoroughly enjoyed listening to it, especially my favorite character in all of the Bryant-May books, the Greater London Area. I think the way we solve problems says as much about us as the puzzle says about the setter. Such as Alexander’s solution to the Gordian knot making him look like a git, but he was probably good in games lessons. Bond looks for someone to kill/shag/marry. Miss Marple compares everyone to a look-up list of single-use characters from her village. Morse applies torturous crossword logic to murders of passion through a fog of beer, opera and doomed love. May just keeps repeating the first solution out loud in the hope it’ll become correct. Bryant’s solution finding process defies my ability to take the piss though. Does it owe anything to your mum’s puzzles? What Mimi said…more than one loose end. I think Arthur’s process is born from the way Mr. Fowler’s brain works, i.e. discursive thinking, rather than Mrs. Fowler’s puzzles. And his love of London. As Mimi points out, the City is a character, perhaps the main character. I too enjoyed Lonely Hour; Arthur finally grows up and realizes it’s not enough to be the smartest guy in the room. I agree that a story told by an omniscient narrator does not have to be examined for unknowable facts (even if we’re told the story is ‘true’) I don’t think Newton’s first law of motion is relevant here, Snowy, because I cannot imagine that the peacock feather stuck forward from the lady’s hat but rather backward so it wouldn’t have come near the gentleman’s neck. [Interesting essay on Newton’s first law suggesting that it would have been more accurately expressed in Greek. Do love those long esses of the period.] My Latin failed me once I’d got far enough to realise what I was looking at. Oh great, bring on the loose ends now, why don’t you? I do quite like loose ends – not everything should be cut and dried, one feels. The books have different editors in the US and the UK, so they are slightly different – but readers in the US do get all of the tortuous linguistically perverse ‘Deep English’ – it’s mostly grammar and words like ‘got’ which are altered. While the suggestion of the defect being in the narrative form, may be ‘caviar to the general’, it may not ‘please the million’. Hence tendered below is an alternative explanation. If we constrain ourselves to only externally observable phenomena. We are told that an elderly man fell asleep seated in a pew. We are told he expired the instant he was touched by the feather. We are told he fell down dead. Taking these observations in sequence. The man, henceforth referred to as the body was in a fully inert state at rest in the pew. He dies instantaneously at the touch of a feather. The force of which would be incapable of causing his body to move from its resting position. Therefore it is impossible for him to have fallen down, dead or otherwise.